ACE e-Manifest and ACI eManifest Filing Services | Pacific Customs Brokers Inc.
On February 19, 2014, President Obama signed the executive order on Streamlining the Export/Import Process for America's Businesses. Automated Commercial Environment (ACE) is the trade processing system through which CBP and its partner government agencies are implementing the Single Window for processing imports and exports. By the end of 2016, the Automated Commercial Environment (ACE) will become the Single Window - the primary system through which the trade community will report imports and exports and the government will determine admissibility. Through ACE as the Single Window, manual processes will be streamlined and automated, paper will be eliminated, and the international trade community will be able to more easily and efficiently comply with U.S. laws and regulations. For more details on ACE please visit www.cbp.gov/ace. For details on the mandatory dates please visit www.cbp.gov/acemandatorydates. The Standard Carrier Alpha Code is a vital part of the e-Manifest process. This unique code identifies the carrier to U.S. Customs and Border Protection and allows for the carrier to file their e-Manifest with CBP. To file for a SCAC code you must apply to the National Motor Freight Traffic Association (NMFTA). You can submit your application, along with a $62.00 application fee, online at www.nmfta.org. You can also submit your application by fax or mail, along with a $70.00 application fee, to 703.683.6296 or via mail to their head office, located at 1001 North Fairfax Street, Suite 600, Alexandria, VA 22314. Once the application has been received, a letter from the NMFTA with your assigned SCAC* code and instructions will be sent to you. * SCAC codes are only valid for one year and must be renewed annually. The process to initially set up your e-Manifest account is simple. Just fill out the ACE e-Manifest Setup Package and submit to Pacific Customs Brokers. Instructions on how to submit are stated in the package. 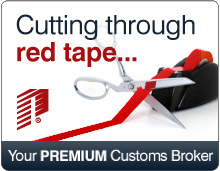 Pacific Customs Brokers can process all of your import transaction needs. In addition to the e-Manifest Filing Service, we can process the U.S. Customs entry documents by setting up the clearance of your goods into the commerce of the United States while simultaneously filing your e-Manifest. Allowing Pacific Customs Brokers to be your sole service provider ensures that all CBP regulations are compliant and accurate thus lowering the risk of delays at the border. Pacific Customs Brokers will file the e-Manifest on your behalf. Once set up, a login and password will be provided in order for you to file your e-Manifest. Pacific Customs Brokers will include 24/7 operational support with either of the service options listed above. For further information on e-Manifest, please contact our Client Services Team via email e-Manifest@pcbusa.com or call toll-free at 877.332.8434.